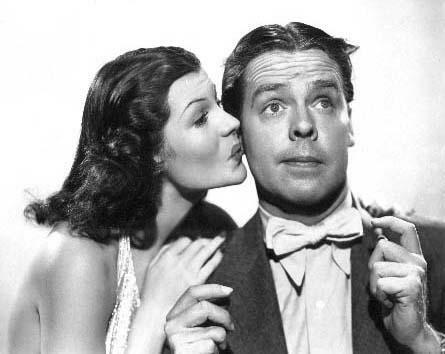 This is a publicity photo of Rita Hayworth (Joan Forrester) with Arthur Lake (Dagwood Bumstead). Rita Hayworth as Joan Forrester. John Qualen as Mr. Fuddle, with Fay Helm as Mrs. Fuddle, and Danny Mummert as Alvin Fuddle. Arthur Lake as Dagwood Bumstead, with Danny Mummert as Alvin Fuddle, watching him eat toast! Danny Mummert as Alvin Fuddle.